Congratulations to "Mary P." and "Maureen C." the winners in M.J.'s giveaway. Thank you to all who participated! This is to be a monumental year for me. My eighteen-year-old triplets will be leaving in the Fall to attend college at the University of Missouri-Columbia, a good four and a half hours away from me. Sigh. It all went so fast! It seems like yesterday they were climbing into my lap to read stories, riding their tricycles up and down the driveway, and pretending to be unicorns in our back yard. Saying goodbye is tough for three reasons. One, the obvious, you’ll miss whoever you are saying goodbye to. I’ll miss the way hearing them come in the door at the end of the day brought an automatic smile to my face. Miss the, “Hey! How was school?” and their answers. Even their unanswers like, “Okay, I guess.” I’ll miss how my son Ryan tells me stories about the residents in the nursing home he works at. I’ll miss the way my son Mitch helps me with my physical fitness. I’ll miss the way my daughter Hannah shares some of the same celebrity infatuations as I do (Hel-l-l-lo, Green Arrow!) But…what I won’t miss-CONSTANT laundry, dirty dishes left to harden on the counter (right above the dishwasher! ), sibling ugliness, going to cook dinner and finding the objects you needed have been consumed despite your warnings...the list is long. A second reason it is hard to say goodbye is the fear of the unknown. I have been a mom for over twenty years, and, of course, I will continue to be a mom, but not in the same way. What will it be like when the noise disappears? (And, I’ve gotta say, we can be noisy!) How will I deal with missing them? What will it be like to walk in the door and not trip over shoes? For my husband and I to have privacy again? So many unknowns. And there’s always that feeling…someone leaves a job and says, “Don’t worry. I’ll be back to visit.” But it’s never the same. Sharing your daily life with someone brings a certain closeness that can’t be achieved any other way. But…there have been many other stages in my life when changes have come, and I was able to handle them. And let’s face it, despite my telling them that I could live in their dorm closets, they are going to grow up and fly away. That is how it is meant to be. And that’s a good thing. …Or so they tell me. A third reason it is hard to say goodbye is worrying about the person/persons whom are leaving. Will they remember the lessons we’ve taught them and make the right decisions? Will the world treat them kindly? Will they meet the right people, move in the right direction, find happiness? How will they do when I’m not there to give them a hug at the end of a bad day? Okay, enough! This is getting depressing and I certainly don’t want to depress you. In life it is all about perspective. Choosing to look at the negative or focus on the positive. I’m proud of all that my kids have accomplished and all they have yet to accomplish. I’m happy for all the opportunities that await them at the University of Missouri-Columbia, my husband’s and my alma mater. I’m excited to have more time for my writing and more alone time with my hubby. More opportunities to travel. More nights where we bag making dinner and go out and eat. And, since we’re season ticket holders at Mizzou, I’ll be able to see the kids at every home game. Change, though difficult, is not always bad. What about you? Has life taught you any tricks to make saying goodbye easier? Anyone out there a change-hater like me? (Everything is fine. Why does it have to change?) Do you cringe when they announce changes at work? Or are you energized by change and ready to try something new? Princess Megan in my latest release, LADY OF THE KNIGHT, has difficulty with the changes in her life. 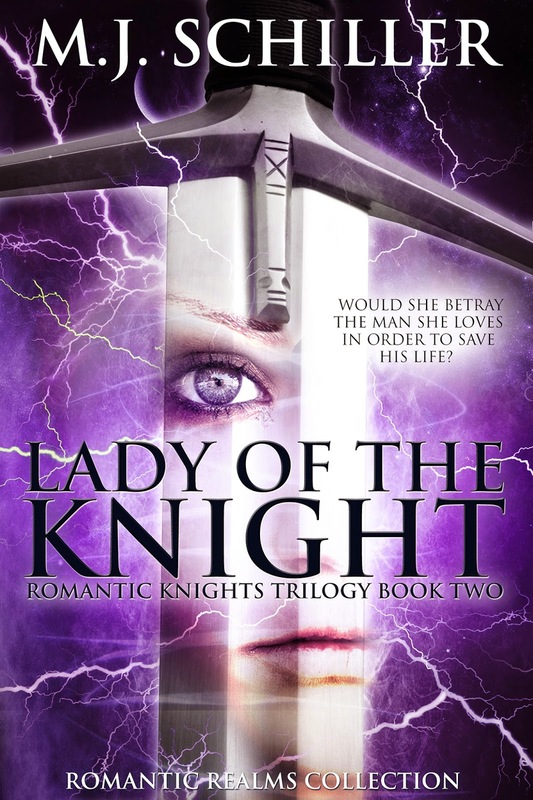 First she has to adapt to being a Knight’s wife, and then everyone believes that her husband is dead, when she can feel it in her bones that he is alive. Is she cracking up? And what do these changes mean for Orion, her husband’s apprentice, the second man that loves her? Aha, ha! You’ll just have to read to find out. Meanwhile, here’s a blurb to entice you further and then I’d love to have you comment if you feel like it. And be sure to enter the drawing for two e-copies of the first in the ROMANTIC KNIGHTS TRILOGY, LEAP INTO THE KNIGHT. Thanks for reading! Can she betray the man she loves in order to save him? Newly wed, Maggie is trying to figure out how life married to a Knight of the High Order is supposed to work. Then an explosion rips her husband away from her. Everyone believes him to be dead, but in her heart she knows it’s not true. How is she supposed to find him when others think she’s crazy for even looking? Will he betray The Order to make his way back to her? Darius’s captor wants information about Council members. If the Knight is killed keeping The Order’s secrets, his newfound life with Maggie will come to an abrupt end. Will duty win out over love? And will he betray his best friend for the woman he loves? Orion has learned to keep his distance from Maggie, but when circumstances throw them together in a very intimate way, how can he be expected to remain a loyal friend to Darius? He may be a Knight, but he’s human, too. He wants to do what’s right for all of them, but what’s right is becoming increasingly unclear. When hearts are pulled in separate directions, each painful decision they make could affect them all. Join us for another ROMANTIC KNIGHT! They both turned to stare out the window at the spot where Darius’s ship had last been. There was no trace of the ship. All that was left was a cloud of debris. A cold wave of shock hit Orion. He froze, his mind grinding to a halt until all that was left was the one thought. Darius was gone. His master was gone. In the back of his mind a voice screamed, “Maggie!” but it took a while for it to register. When it did, it rang clearly. “Maggie.” He looked over and then reached out to comfort her but she shrugged him off. “Maggie…” He was at a loss for words. How could she deny what she saw with her own eyes? Skruggs pushed up his glasses and dutifully punched several buttons on his console. “There are no signs of life, sir. I’m sorry,” he added compassionately to Maggie. Something seemed to snap inside of her, and she charged at the man, emitting a growl. Orion stepped in front of him and grabbed her by the shoulders. “YOU LIAR!” she shouted at the man vehemently. “Orion, he’s lying to you.” She gazed into his eyes, her face still enraged but also pleading with him. “Can’t you see that he’s lying to you?” Her jaw tensed, and her eyes became hard. “Do something, Orion.” At the end, her voice cracked. “Maggie, honey...” He tried to find the words to reason with her. 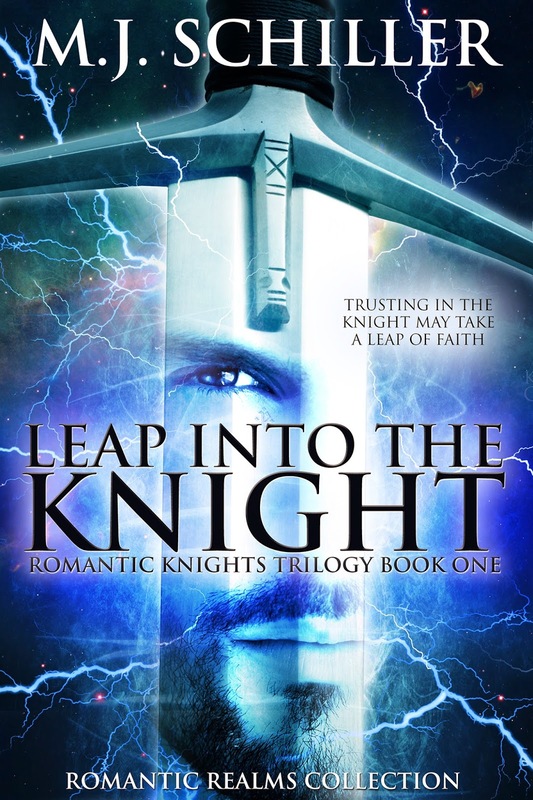 Giveaway:I'll be giving away two e-copies of the first in the ROMANTIC KNIGHTS TRILOGY, LEAP INTO THE KNIGHT to two commenters or email entrants. M.J. Schiller is a lunch lady/romance-romantic suspense writer. She enjoys writing novels whose characters include rock stars, desert princes, teachers, futuristic Knights, construction workers, cops, and a wide variety of others. In her mind everybody has a romance. She is the mother of a twenty-year-old and three eighteen-year-olds. That's right, triplets! So having recently taught four children to drive, she likes to escape from life on occasion by pretending to be a rock star at karaoke. However…you won’t be seeing her name on any record labels soon. Giveaway ends 11:59pm EST April 25th. Please supply your email in the post. You may use spaces or full text for security. (ex. jsmith at gmail dot com) If you do not wish to supply your email, or have trouble posting, please email maureen@justromanticsuspense.com with a subject title of JRS GIVEAWAY to be entered in the current giveaway. Thanks for having me today! As always, I've enjoyed being part of Just Romantic Suspense! It was tough when we brought our son to college at first but then as I saw that he was happy and doing well then I was happy myself. Best of luck to your children as they heat to college. Thanks, Maureen! I'm sure we'll make it through it. But first I have to make it through all of the home improvements leading up to the graduation party. If I can do that, I can do anything! I appreciate your comment and advice. Hello- from another Maureen ;) I did almost tear up at your beautiful post, because although I have a few years (my twins are 13) I've started to think about such things as they prepare for senior high in the fall. Thinking how it will be a bigger shock with them both leaving at once...and you've got three! Wow. Hope you enjoy and make the most of your empty nest. I'll pray for you, Maureen. It really is both good and bad. Last night when I was doing a huge stack of dishes I was thinking that cleaning up after two will be a heck of a lot easier! ;) Thanks for joining us! I love M.J. Schiller books! I think that change can be a good thing. It's surprises I'm not happy with. True. I have had eighteen years to prepare for this. Thank you for offering the bright side, Mary. And thanks for stopping in! I can't imagine three at a time of anything kid related from diapers to college departures. You must be a Super Mom. Think roots and wings, right? I went to Amazon and discovered what I missed in reading your bio before...that you also write romantic suspense! Duh. This is, after all, the JRS blog. :-) Can you tell I'm ditzy this morning? In any event, romantic suspense is another fave reading genre of mine. Moving makes us all a little ditzy! ;) Alas, time marches on whether you want it to or not, and you just have to roll with it, right? I've been very blessed to have them with me for the past 18 or 20 years. And I know we have a lot of great times ahead. Thanks for joining us today and offering your insights. It is much appreciated! When my son goes away to college, I'll probably try to follow him. Lol. Congratulations to your triplets. I know you must be so proud. At least they will have each other to lean on during their transition. Hey, if you figure out that following thing, give me a shout out, would ya? ;) Yes, it's great that they'll be together. Certainly it makes the logistics of moving them in a lot easier. I wasn't sure how we'd manage if they all three went to different schools in different parts of the country. But once we visited Mizzou, even though it was our alma mater,we were all impressed and they knew it was the right place for them. Thank you for reading my post and joining in the conversation and offering your kind words. :) We moms get each other! Yes. But at least the one I'm facing isn't permanent, although things are permanently changed. Now that I think of it, there are so many kinds of goodbyes we have to face--deaths, break-ups, friends moving, kids growing up...all painful, all part of life. But if we face loss, it means we had something to lose in the first place, so I guess we should be grateful for that. I am grateful that you joined us today and wish you all the best!